It's that time of year where you get to let everyone know just how much you love them. How fun is that? Here at Ewe Ewe we are always talking about how much we love our yarn, our yarn stores and our knitters. 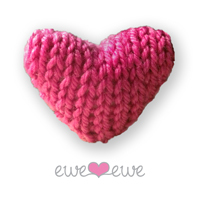 And what better way to show our love than with this adorable Ewe Ewe Heart Heart garland! I made a bunch of the little hearts out of Wooly Worsted (our berry color is just perfect for Valentine's Day! ), stuffed them with poly-fil and simply threaded the tops along some fishing line. It makes a great garland, I might just keep it up all year! I love the garland hanging over the mirror in my foyer because then it seems like I have double the hearts! Happy Valentine's Day, everyone! And, happy knitting!